In 2015, NCR Restaurant Technology Pulse conducted a survey that revealed that Wi-Fi technology is fundamental to 74% of restaurants. NCR, a consumer transaction company headquartered in Georgia, USA, conducted a survey of more than 150 restaurant owners and managers to estimate how technology influenced the growth in restaurant’s revenues. The survey found that for 74% of restaurants Wi-Fi is one of the fundamental technologies to use and for 67% technologies have exerted great influence on restaurants’ increased revenues. As the food service marketplace is a fast-paced environment facing a conglomeration of business challenges on a daily basis, restaurants are already relying on various technologies to run their daily activities. Chris Poelma, president and general manager of NCR Small Business, pushes restaurants to adopt “complete technology solutions [to] simplify their business and help improve efficiency and drive revenue.” This is when technology (Wi-Fi-enabled technology, in particular) comes in handy. 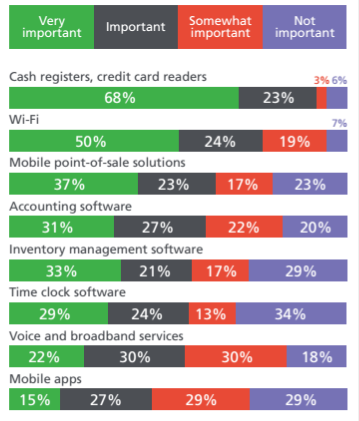 In the aforementioned survey, which ranked technologies in 4 categories based on percentages (as shown on the image on the left), the preferred technologies currently used by restaurants are cash registers and credit card readers – with a 68% share. Wi-Fi came in second with a 50% share, followed by inventory management software with 33%, accounting software with 31%, voice and broadband services with 22% and mobile apps are last in line with a 15% share. 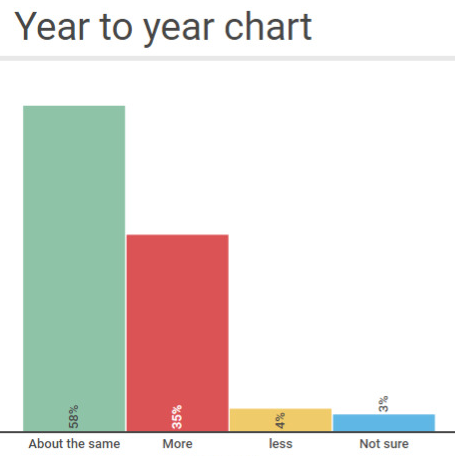 When asked about the difference in demand for technology from year to year, 58% of the respondents answered that they experienced the same effect of the technology in their everyday activities at work, 35% said they were more dependent on tech tools compared to last year, 4% declared that the technology had less impact on their business in comparison to last year, while 3% were unsure about the answer (as seen on the graph below). Although the usage of technology has increased, restaurant owners and managers still have many challenges to overcome. The main problems according to the respondents regarding the usage of technology solutions are the costs of maintaining or upgrading technologies, the lack of staff members who have strong IT skills and the scarce Wi-Fi management tools. Nowadays, these problems can be easily addressed using innovative Cloud-based technologies (also called SaaS – software as a service), that deliver web applications with a scalable formula, like Tanaza. Additionally, Cloud-based, SaaS technologies do not require the installation of hardware as it is accessible via the Internet, and is delivered and managed remotely.